Discussion in 'GPS Tracks - Central, Texas & Gulf States' started by Cannonshot, Apr 3, 2012. 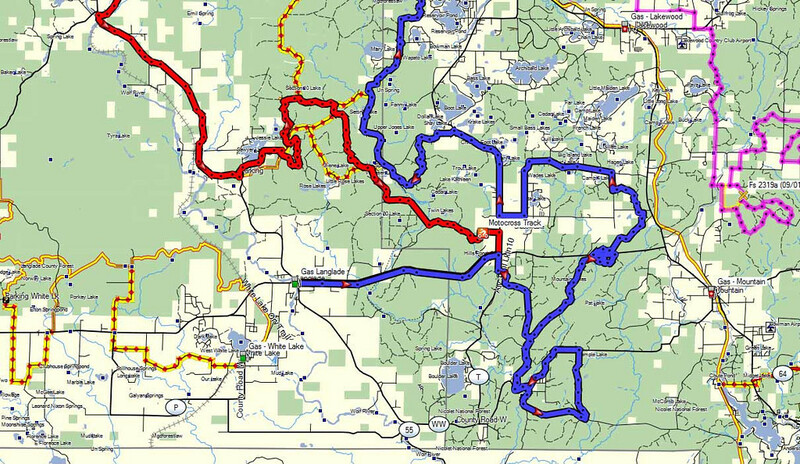 This ride consists of two loops that total 282 miles that will fill a weekend of dual sport riding. 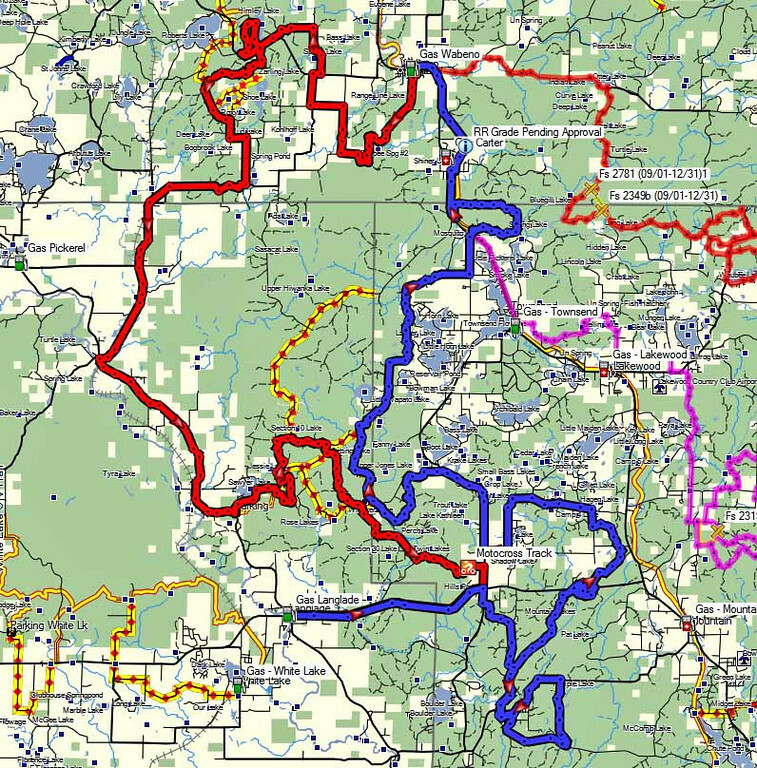 The loops are principally in the National Forest south of Wabeno. I initially developed these tracks to use as part of a dual sport event. 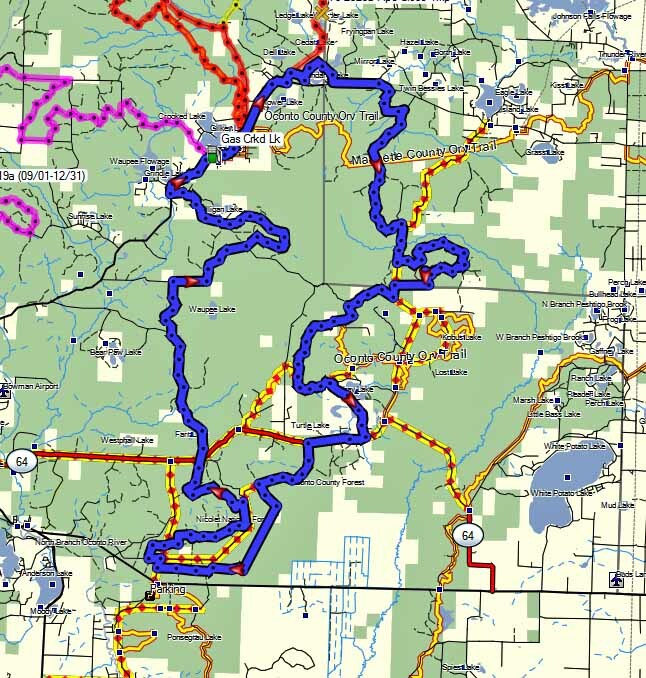 The forest service found that the extensive use of somewhat dim forest paths on these tracks would have made permitting for a major group ride so time intensive that a time/fee threshold would have been exceeded triggering some significant costs. Based on that, the event hosts were not able to use the tracks. Nonetheless, the tracks are an excellent ride for people to do on their own. 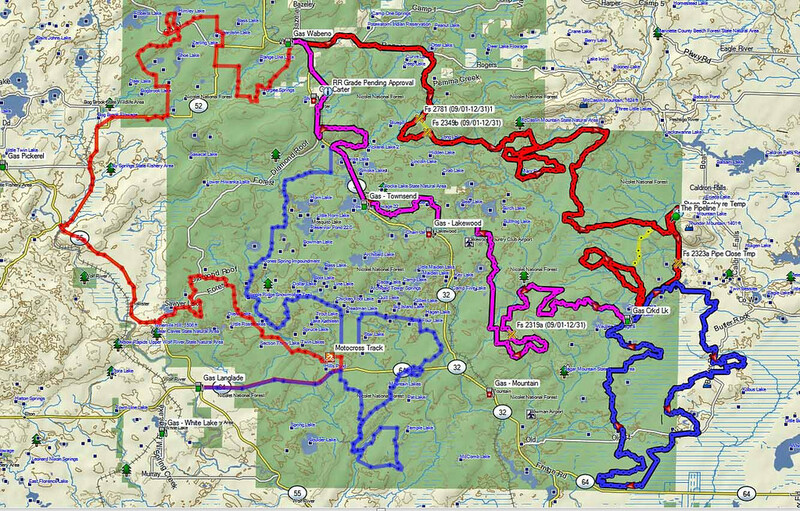 As you know, riding dual sport motorcycles as individuals apart from an event is permitted on paths open to motorized use in the National Forest. I checked these tracks against the Motor Vehicle Use Map and they are good to go except for a couple of spots where there are seasonal limitations which I have noted and provided alternate routes for. Here is an overview of the tracks. They begin and end in Wabeno. The first segment from Wabeno to gas in Crooked Lake is about 63 miles. There are two potential closures on this segment. The first is indicated by the yellow go-around and shows that a side loop is only open in the fall. The second go-around has to do with a temporary closure on a popular rugged 4WD path called "The Pipeline". This segment normally opens on 1 June but is temporarily closed until some repairs can be made. As a side note, I wouldn't ride into any water holes on the 4WD path as you may find they are very deep. 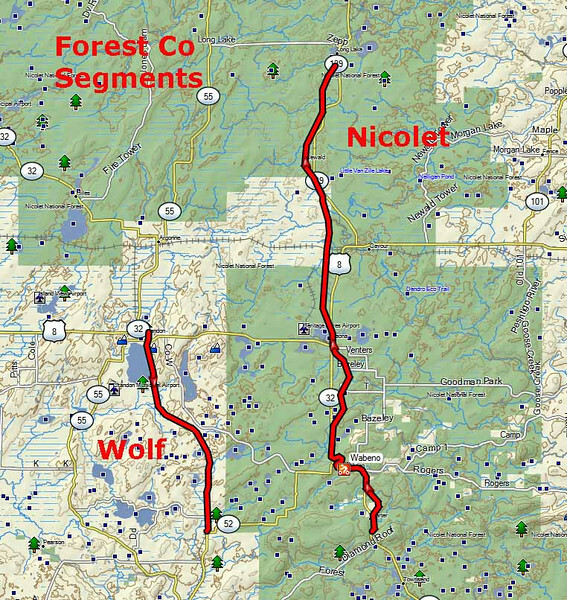 On the way to Crooked Lake, you will be routed onto an ATV trail in the National Forest. 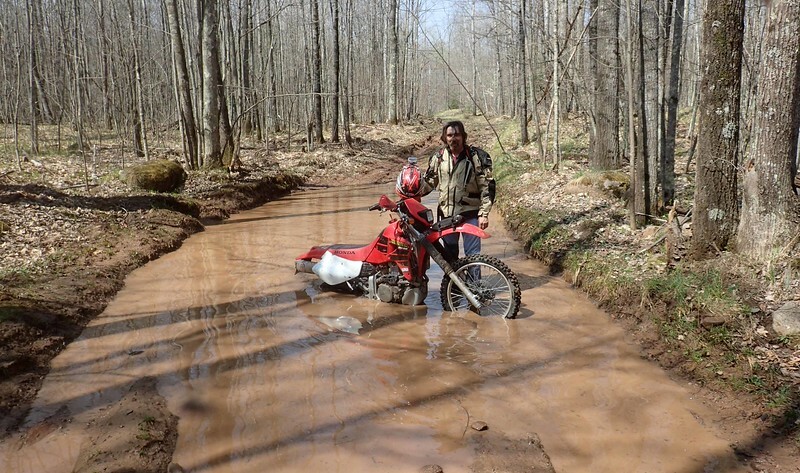 Normally motorcycles are not allowed on this county ATV trail, but in the National Forest the trail is a road on the MVUM that is open to dual sport motorcycles so these is no problem with using the trail included on this track. Once at Crooked Lake, get gas and then decide if you want to take the blue loop south of Crooked Lake. If it is early in the day, go for it. If it is late, you can by-pass it and head back toward Wabeno. The blue loop is about 43 miles long and can be a sporty ride. Once back in Crooked Lake, top off and head back to Wabeno on the third segment which is 47 miles long. There is also a seasonal go-around (yellow) on this route. The dates are listed and the main segment that is by-passed is open in the fall. Note that you will again be routed onto an ATV trail that is a forest road as described earlier. Once you get to Forest County, you are allowed to ride on the multi-use rail road grade trail that goes back to Wabeno. 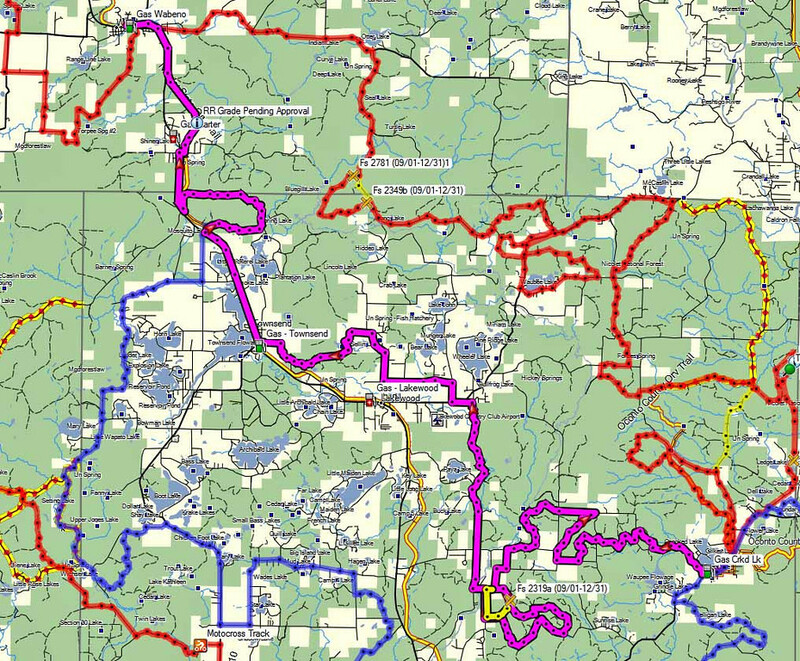 We recently were able to get permission for dual sport motorcycles to use the Forest County portion of this State trail. The above loop is my favorite of the two. The people that have test ridden the path found it to be a challenge and a blast. The second loop is better for a shorter day. It runs about 130 miles with gas at 62 and 67 miles. This one has a little more road on it because in some spots there were few alternatives. As before, the return trip on the railroad grade trail in Forest County is open to dual sports as long as the trail is open (probably opens in May). The motocross track is private and not part of this loop. Have fun but exercise due caution. Don't ride this alone as there are some pretty dim spots along the route where people seldom go. And for those who would like to ride out or camp from the S.E. end of this track PM me. I know of some groomed spots in the forest with fire rings or could point you to some camp grounds and/or secure parking. Also got a garage full of tools, a truck, and some bike parts if needed. PM ahead of time for an emergency contact number. 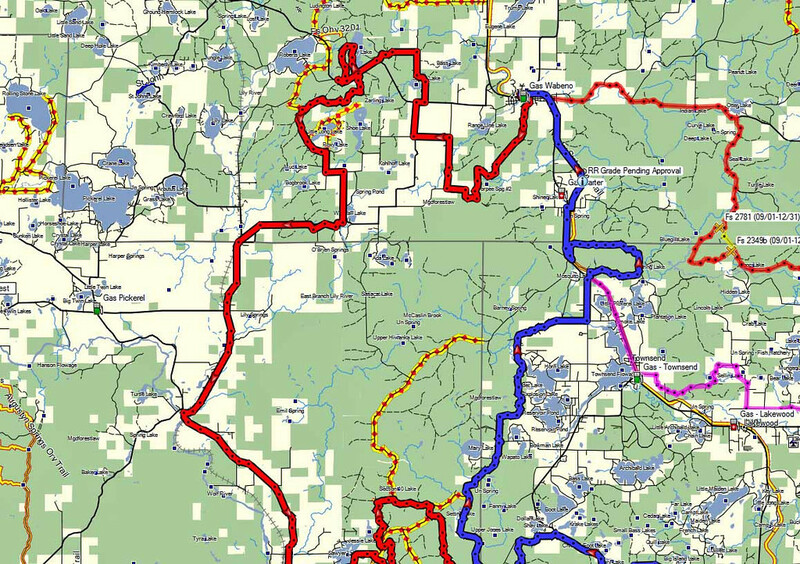 If you are going to ride the South of Wabeno tracks, don't forget that the Forest County segments of these two State trails will be open to dual sport motorcycles starting this season. Might be fun to take an evening ride on these. Anyone riding this solo today? Past a dude on a new looking KTM wearing new looking gear (or at least clean), somewheres between Crooked Lake and Waubee Lake. I was out trying to get lost, and probably crossed Cannon's track a few times. I dang near stopped. Looked like he dang near stopped. I thought about pulling a U-turn and running him down.... But he was on a KTM, and I'd never catch him on a Yamaha . Would anyone be interested in doing this ride this weekend? I'm a little new to the avd dual sport thing (1 year) and usually ride alone, but as Cannon says this ride should not be done solo. I've been to the last 2 CADVR rallies, last 2 Wabeno rides, Leaf River this spring and numerous trips to Black River Falls (on the trails and single track). My riding skills are fair (translation: no speed demon, I've been known to tip over, but up for the challenge). Have GPS and the track (thanks Bryan, all you do for the community is greatly appreciiated) and no fear of following the route. Looks like a nice campground just north of Wabeno with full sites and cabins, showers and and all the rest. Have not checked on availability yet though. Kaanan Knee deep in snow. That blue loop looks promising, I'll have to check it out this weekend. 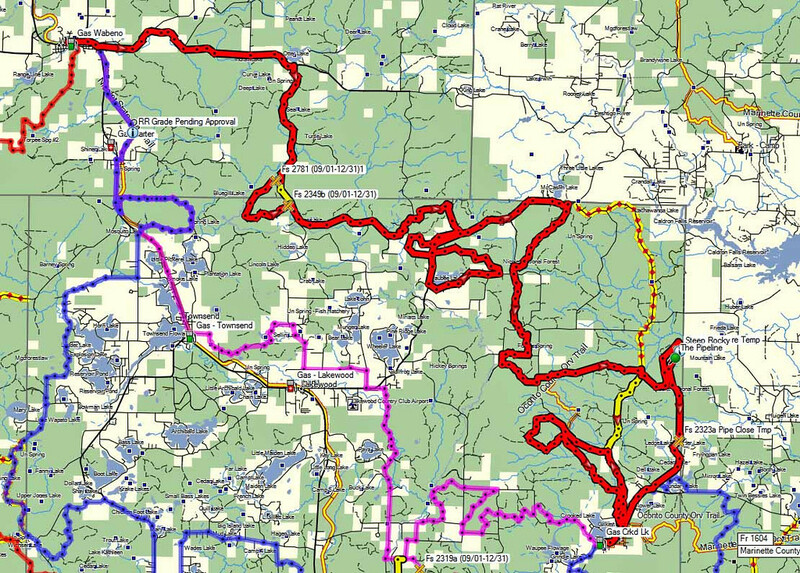 Cannon, you say the blue loop is "sporty", does that mean gravel roads? Rolling and winding dirt forest roads in the sporty section. Should be a lot of fun after all the rain they just got. 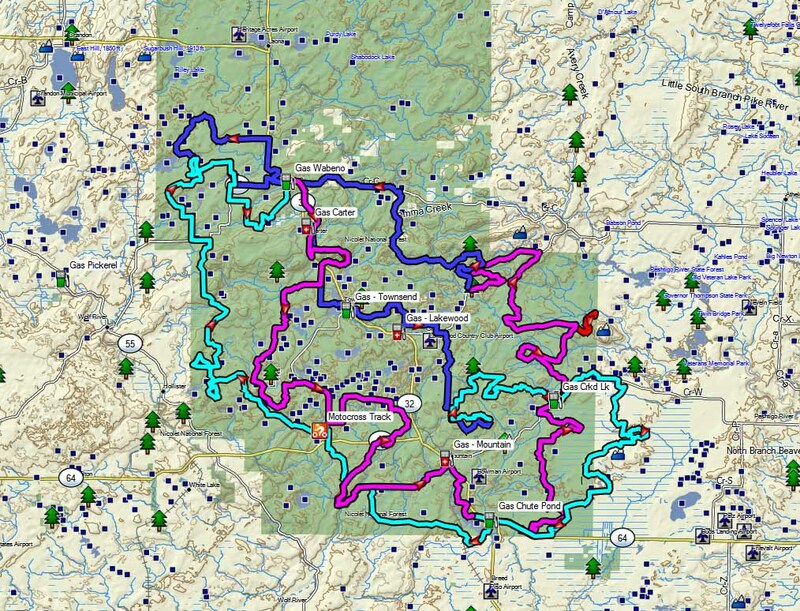 I can upload GPX to ADV again so here is another. Downloaded 2131 times from a prior private site. Chute Pond campground based version. 180 miles and 8 hours Saturday, 130 miles and 5 hours Sunday. Previously downloaded 1516 times from a prior private site.